After Charlotte’s father is kidnapped, she and her mother must overcome their differences and find a way to rescue him in this eloquent, moving portrayal of family. Charlotte’s father specializes in nature’s acts of violence. In search of the perfect story for his newspaper, one that can put a human face on tragedy, he will fly into the eye of the storm. And now he’s heading to Ukraine, straight into the aftermath of a deadly earthquake. Charlotte doesn’t want him to go, leaving her alone in a silent house with her mother, whose classically Russian reserve has built a wall that neither of them knows how to tear down. But she’s holding it together okay—until the FBI comes knocking on their door. The quake has left many orphans, but Charlotte refuses to be counted among them. Whatever it takes to get her dad back, she’ll do it. Even if it means breaking a promise . . . or the law. 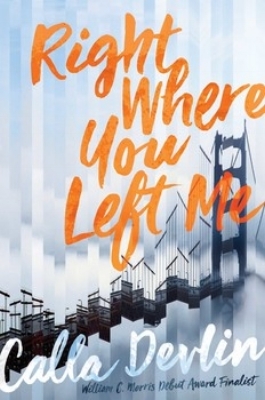 Buy Right Where You Left Me: IndieBound, Barnes & Noble, or Amazon. DSM Magazine: Calla Devlin on pivotal moments in her development as a writer. Profile in the Cedar Rapids Gazette.